When you are short on rent, $300 might as well be $3,000,000. Finding the money seems impossible. But don't despair! 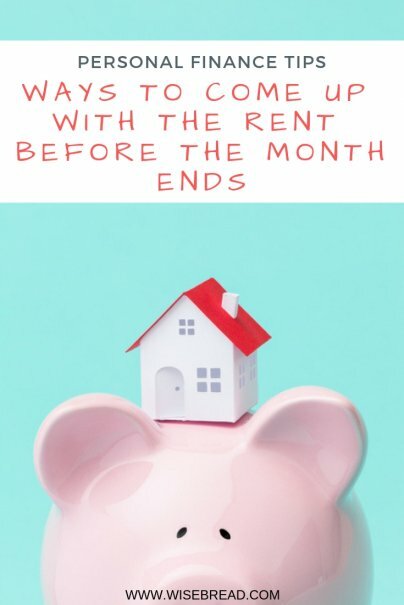 Here's a list of ways to come up with the rent this month and every month. Do people owe you money? Now is the time to call in those loans. Did a recent shopping spree put you in this rental money crisis? You can even return unused items through your credit card if the store refuses. Let your employer and your coworkers know that you are looking for additional shifts. Is your employer paying an outside contractor for work you could do on the side? Offer to do the job for a flat fee (to be paid outside your regular paycheck). My husband's company pays up to $5,000 per referral to employees who successfully recruit top talent. Some employers allow their workers to make pre-tax payroll deductions to help pay for commuting costs. Other employers offer money saving commuter perks like free parking to carpoolers, free use of company bikes, or paying for public transit costs outright. Every job that I have ever loved I have invented. Find something that needs to get done and do it for money. Babysit for your neighbors. Monetize your DJ abilities. Shovel snow. There are all sorts of long- and short-term jobs that require your skill set. Farms are always short on labor. It's a physically demanding way to make a buck, but if you like working outside, day laboring on a farm might be a solution to your financial woes. Also, a side perk of many farm jobs is access to free produce. Reduce your grocery bills and get the rent paid! Are you paying for multiple streaming video services? Can you entertain yourself with just one? Or, can you suspend or delete all of your subscription services until you get a grip on your finances? Examine your bank statements closely. Are you paying extra fees for services that you don't use? Call your credit card company. Are you getting the best interest rate that you can get? There are many free apps and programs that provide a premium service for a fee. Are you using each of the pro versions enough to warrant the extra costs? One of my friends tracks all her reward programs on an Excel spreadsheet so she never misses a perk. Are you leaving money on the table? Can you cash out your reward points for gift cards that you can resell or use to offset other line items in your budget? In some states, you can get cash for gift cards with a low balance. But there are a number of other ways to convert gift cards into cash. My husband just made $960 selling his old Nintendo, Super Nintendo, and Dreamcast games. But even more recent games can have value. Last year, I sold a copy of Kuon, a PlayStation 2 game, for $200. Vintage analog toys such as board games, Breyer horses, Matchbox cars, Lego sets, action figures, and dolls can all fetch a small fortune on eBay. My friend Steve sold his collection of vintage Blythe dolls for $29,000, enough pay for the down payment on his home! Sell bulky and hard-to-ship items like furniture, cast iron pans, and glassware on Craigslist so you don't have to fiddle with shipping. My husband and I throw three garage sales a year that net us between $500 and $1,000 annually. Our garage sale inventory consists of random crap we couldn't sell elsewhere for more money. We price our garage sale merchandise to move, typically charging $1 to $5 for just about everything. The way we see it, if people are paying us to declutter our home, they deserve the bargain. To augment our garage sale profits, we sell lemonade or brownies for $1 per serving. In cold climates, you can sell hot cocoa or coffee to your shoppers. Are you already a minimalist who sold all her stuff ages ago? Don't worry. You can always sell other people's stuff! Since most rental contracts start at the first of the month, the last week of the month (when people are moving out) is always a great time to scrounge for curbed furniture and other items that renters don't want to pay to move. Sell your found treasures at a garage sale, or use Craigslist or an app like 5miles to advertise your merchandise to local customers. Why give the $.05 rebate per can that you paid for to someone else? University campuses and concert venues are a prime place to scrounge for bottles and cans. While you will make more money selling your media on sites like Amazon and Half.com, you may not make an online sale in time to help your rent payment. For fast cash, sell your books, movies, and music to brick and mortar stores in your area. Do you have a green thumb? Root cuttings from your garden or hook up with a local landscaper for their castoffs. Or, sell heirloom vegetable seedlings. A package of 25 tomato seeds costs me about $8, or $0.40 per seed. But I can sell my tomato seedlings for $2 each at my neighborhood farmers market. There are numerous legal ways to sell your body for money. You can sell your sperm or eggs for thousands of dollars, but those donations require that your money be escrowed for at least six months and an equally long time commitment. For quick rent money, you can sell blood, platelets, plasma, breast milk, and, if you live in Massachusetts, your poop. Do you have a less convenient, but also less expensive commuting option? Now is the time to learn to love the bus. Save on gas money and car repair costs by walking, biking, carpooling, or taking public transportation to work. My friend Duke operates a mobile record store every Friday on his train commute to work. My neighbor knits hats during her daily bus rides. She makes enough money each month with her commuter knitting to pay for her metro card. Pro tip: If you can find a housesitting gig at the same time, you can double up your house-renting profit. Even if you don't have space to rent out, you can still be a host via the Airbnb Experiences program. Airbnb is a great place to advertise your local expertise as a specialty tour guide. For example, a chef could host a two-hour cooking experience or an experienced hiker could host a multiday camping excursion. Rent your garage out to your favorite local band as a practice space. Or, if you value your peace and quiet, rent your garage as studio space for photographers, sculptors, and woodworkers.